The following information will help you plan your holidays to Formentera by giving you an overview of the island. Formentera is a quieter, more peaceful island than Ibiza, better for visitors looking for relaxing days on the beach, a good meal and an evening stroll rather than a hectic nightlife. Formentera holidays are therefore popular with families and has beaches to meet all expectations. The saltpans in Formentera [Las Salinas] are little used now as the salt trade has all but died out. However, they provide a good refuge for wildlife and occasionally even flamingoes have been reported. Sant Francesc is the islands capital and is the best place for local souvenirs, such as knitwear, ceramics, cheese, honey and Formentera’s own hierbas drinks. There is a small ethnological museum showing the islands history [Carrer de Santa Maria] which is open during the summer months. There are sailing, windsurfing and water-skiing opportunities on your holidays , and some of the Formentera beaches have pedaloes for children. Only 4km separate Punta de ses Portes [the most southerly point on Ibiza], from the northern tip of Espalmador [the island off Formentera’s northern shore]. Numerous boats leave the harbour of Eivissa [otherwise known as Ibiza Town] in Ibiza for Formentera every day during the summer months. Leaving from Eivissa, the boats offer a wonderful view of Dalt Vila and Ibiza’s southeastern coast and soon passes the lighthouse on the islets of Poejats and Porcs to reach the long, plat S’Espalmador, its watchtower prominently visible. Formentera does not have its own airport. You will need to fly into Ibiza [IBZ] and then by boat to Formentera. On the eastern side of the Trucadors peninsula. More weather-swept than the western side, so occasionally has real breakers. Popular with nudists. Swimming is good on calmer days and facilities are reasonable. On the western, more sheltered side of Trucadors. Formentera’s official nudist beach which has good facilities. Excellent beach close to one of the islands major tourist areas with excellent facilities. Close to La Savina. Too close for some as it is the easiest for day-trippers to each although the facilities are good. On the northern edge of the thin piece of land linking La Mola and the rest of the island. Long enough to offer privacy, but can be windswept and with reasonable facilities. [Also known as Plaja de Migjorn] – A huge and very beautiful beach, with clean white sand and equally clean blue water. Understandably popular, but big enough to absorb vast crowds and with excellent facilities. A great choice for those on a family holiday to Formentera. Apart from the local products you will find in the shops in Sant Francesc, an the inevitable souvenir shops elsewhere, one shop in the island capital makes traditional musical instruments from local raw materials. Ask for the workshop of Can Vicenc des Ferrer. At El Pilar, look out for the island knitwear from the Merceria La Mola shop. During the summer months, a small arts and crafts market is held in the mornings on the Plaza de la Constitucion in Sant Ferran and although you wont find much variety, the array of wares for sale is very colourful. If you are looking for some good locally made souvenirs on your Formentera holidays, pay a visit to the craft market of El Pilar, a hamlet in La Mola, which is held every Sunday afternoon. Here you will find a range of ceramics, jewellery, leather goods and knitwear made by the local arts and crafts community. Mallorca, or Majorca, is the largest of Spain’s Balearic Islands. 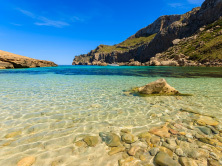 Mallorca holidays are very popular due to the assurance of fine summer weather and good beaches, with wide range of accommodation, food, entertainment and leisure facilities available. 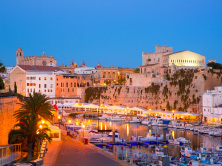 Menorca holidays have their own charm and actually has more beaches than Mallorca and Ibiza combined. Not that holidays to Menorca are all about beaches! It boasts an array of ancient sites and monuments, many still lying undisturbed. With the high level of tourism and the club scene filling several of the towns and most of the beaches in Ibiza, it could be easily assumed that peace and quiet were the hardest thing to find. But there is another side to this vibrant island, waiting to be discovered.